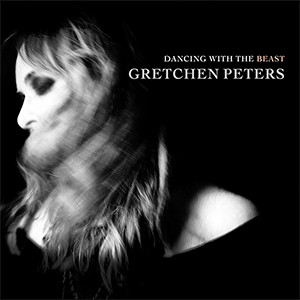 It's been three years since Gretchen Peters released her award winning album, "Blackbirds", but now she's back with her new album - "Dancing with the beast". Written during 2017, in the aftermath of 2016's US elections, with the Womens march and #metoo movements happening, it's not a surprise to find that female characters are at the heart of some of the songs on the album. While "Love that makes a cup of tea" is about a mother's love, and seem's an obvious choice for a female character to sing about, "Truckstop angel" is about a prostitute at a truckstop, and was inspired by an old New Yorker article and then more recently seeing a young prostitute at a truck stop. It's an unusual subject but one that Gretchen Peters has turned into a beautiful song. As with all the songs on the album, the lyrics draw you in and make you focus on the story she tells. "Lowlands" talks about the aftermath of the election and the divisions it caused , as she sings about avoiding her neighbour since they put that sticker on their bumper, the TV lying to keep you watching, and politicians lying to get your vote. With no chorus, just verses, there's no break - something Gretchen Peters did deliberately to reflect that 2017 seemed to go on with no break, just relentless. Check out the video to "Disappearing act"..
Gretchen Peters really is superb at storytelling in the lyrics of her songs, and can turn an unlikely subject into a compelling song. Her songs always have beautiful arrangements that never distract away from the vocals - the lyrics and vocals are the focus in the songs, with the music simply enhancing them. With some artists the music is the focus, but while you could just listen to the music and vocal melodies with a Gretchen Peters song, you'd be missing so much as the lyrics are so good. I loved "Blackbirds" and was expecting this new album to be just as good, but in fact it's even better than "Blackbirds" - it's an absolutely fantastic album. Gretchen Peters will be on tour in the UK from mid-May to mid-June.